Be the first to share your favorite memory, photo or story of Velva. This memorial page is dedicated for family, friends and future generations to celebrate the life of their loved one. 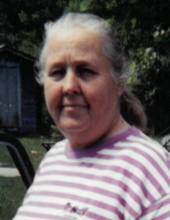 Velva Jean Martin, 79 of Dayton passed away October 24, 2018 at home after an extended illness. She was born January 11, 1939 in Onalaska, Texas to parents Robert Elliott Brown and Rebecca Ellen Barnett Brown. Graveside service for Jean will be 1:30 p.m., Monday, October 29, 2018 at Magnolia Park Cemetery in Dayton. Visitation will be 11:00 a.m. until 1:00 p.m. Monday at Pace-Stancil Funeral Home. Velva Jean had lived most of her life in the Dayton area. She loved all her children and grandchildren, she helped each one at any time. She could always be depended on for advice, food or a place to stay. She loved to cook, tell stories about her kids growing up, life on the farm with her late husband who worked the farm and how they raised the kids together. She loved her chickens, puppies, sitting on the porch with family, and quilting. Jean always put others before herself, loved everyone around her and nothing made her happier than to be with family and the kids. She was preceded in death by her parents, husband Alvin B. “Shorty” Martin; son, Alvin Clifford Martin; baby son, Jesse Martin; brothers, Elvin Brown and Clayton Brown. She is survived by husband, William L. Cox; daughters, Darlene Reed and Vernon Stephens, Lisa Smith and Delta L. Martin; sons, Clayton Martin, Nelton Martin and wife Christi, Chance Martin and wife Amy, Gene Martin and wife Debbie; brothers, Doug Brown and wife Brenda, Melvin Elliot Brown and sister-in-law, Betty Brown; grandchildren, Velva Nicole and Josh, Tyler and Kamille, Josh, Zach, Teresa and Jake, James, Amber, Bryce, Brantley, Montana, James Clifford, Jesse, Brandie and Eric, Meredith and Derrek, and Shelly; great-grandchildren, Braylee, Aubree, Brianna, Teagon, Marcus, Andrew, Levi, Jayden, and LeeAnn Rose; numerous nieces, nephews, other relatives and friends. To send flowers or a remembrance gift to the family of Velva Jean Martin, please visit our Tribute Store. "Email Address" would like to share the life celebration of Velva Jean Martin. Click on the "link" to go to share a favorite memory or leave a condolence message for the family.